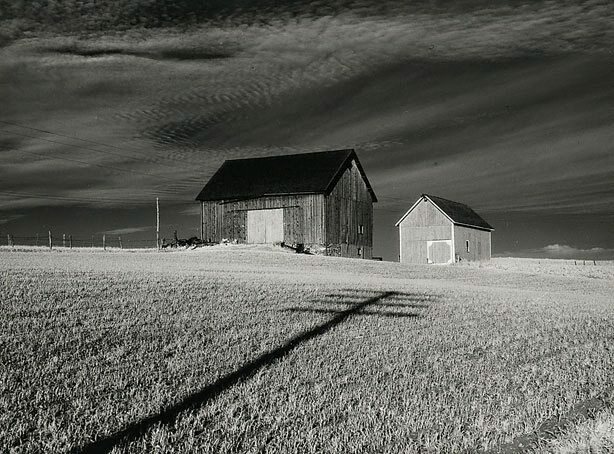 This image was part of a sequence of landscapes in which Minor White experimented with infrared film. Infrared film is sensitive to infrared light, UV light and the light that people can see. The use of this film renders blues, browns and dark greens darker, while reds, whites and light greens are rendered lighter, producing images with a high contrast between light and dark. Such film is best used in the mornings and evenings as the angle of the sun through the atmosphere at these times produces more infrared and gives a more dramatic result to the image. White's use of infrared gives a strong dramatic feel to the image as it seems that the buildings are suspended between the white plain of grass and the bright swirling clouds. The shadow of the cross adds a strong graphic element to the image. Minor White, Minor White: rites & passages , 1978, 121 (illus.). Minor White, Mirrors, messages, manifestations , 1969, 105 (illus. ).